This holiday season, gift cards are all the rage. According to research by WalletHub, gift card sales are anticipated to top $160 billion in 2018. Gift cards are great for consumers. They’re a no-brainer gift to give — who doesn’t love to receive cash to spend in a favorite store? And they’re even better for businesses. A First Data study found that in 2016, 75 percent of consumers with gift cards spent $27.74 more than the amount on the card, a 69 percent increase from 2015. And since 85 percent of gift cards are redeemed in the first 60 days after they’re received, selling them at your store during the holidays gives your business a nice boost in sales during the first few months of the new year. Square makes it easy to sell gift cards — whether in your brick-and-mortar location, online, or both. There’s no subscription or redemption fee to run a gift card program with Square, and you can sell, redeem, track, and reload without any additional tools (it’s all integrated in your POS). You can also work with pre-designed templates (for both physical or eGift cards) or create your own custom look. That means that all you have to do is sell the gift cards. If you’ve never offered gift cards before — or you already offer them but need some ideas to jumpstart sales — here are some ideas to help you sell a ton of gift cards this holiday season. Use visual displays and signage: Give your gift cards pride of place next to the register to maximize gift card sales. You can set them up in dressing rooms, waiting rooms, hostess stands, on the pickup counter, or in window displays. You can also showcase them on your signage — places like menu boards or sidewalk signs. Utilize receipts: Include a callout to your gift cards on your receipts (you can add and customize that sort of customer-facing message on your Square receipts in your Dashboard). Go omnichannel: If you offer eGift cards, consider posting signs to let customers know that they can purchase those online. Offer a deal: Consider sweetening a purchase by offering a gift for the person buying the gift card. For example, “Buy a $50 gift card and get a candle for yourself.” Or offer a discount for the gift card, such as selling a $100 gift card for $80. Join together: Create a gift card co-op with other local businesses to promote shopping in your community and expose your business to new customers. Be bold: Make gift card designs bold so they’ll stand out. Try a bright interpretation of your logo or a fun image, or purchase holiday-themed cards for the season. If you have a website, ensure your Square eGift cards are in a prominent space for shoppers to see. You might even consider adding a banner or simple pop-up message to encourage clicks and garner interest. If your website includes e-commerce, add a link to your eGift cards order page. You might also create discounts and promo codes for your eGift cards. In addition to selling gift cards on your own website, you can sell them on social media — like Facebook or Instagram -— or on marketplace sites like Etsy. These sites are especially good if your own website doesn’t have e-commerce capabilities. It’s important to be strategic about which sites make the most sense for your products, brand, and customers. When posting, ensure your gift cards get visibility in relevant searches by tagging your ad with keywords and phrases (or hashtags on social media) that shoppers might use to find your products or services. The advice above works if you can get someone to your store or website, or your profiles on social networks or marketplaces. But if your customers don’t know you offer gift cards, they can’t buy them. So you need to invest in promotions and marketing. Get the word out to your current customers through your social media channels and through email marketing. Create fun campaigns that include photos of your gift cards with your products, and mention any promotions you’re having. 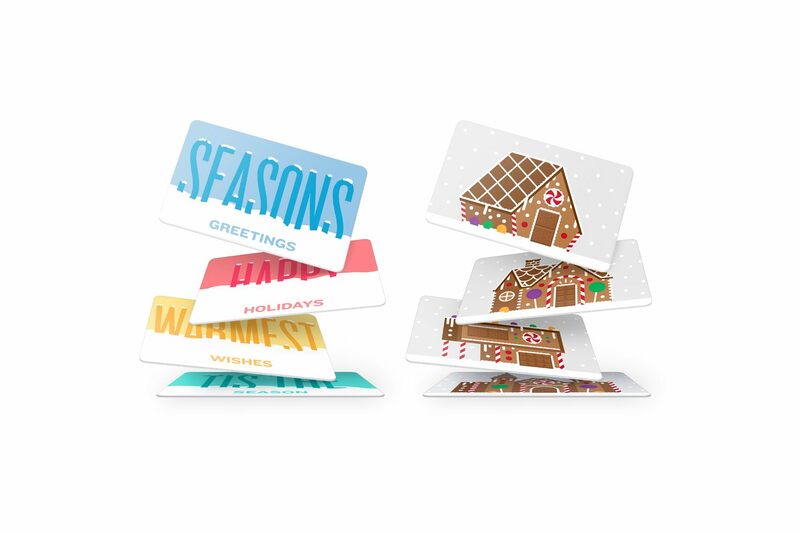 campaign that gives away gift cards. Invite people to submit some kind of holiday content (this could vary based on what your business is) with a hashtag specific to your business, or photos of what they would purchase with their gift card. Then award the best submissions. Gift cards are integrated right into your Square Point of Sale and Dashboard. When a customer pays with a gift card, just swipe the card and the balance will update automatically. Customers can easily add more money to their gift card at any time. All gift card transactions will show up in your reporting, and you can export a full report of gift card sales right from your Square Dashboard. And once you’re up and running, you’ll receive deposits for gift card activations instantly, or within one to two business days. Our new holiday gift card designs have just arrived. There’s no better time to stock up before the holiday rush.